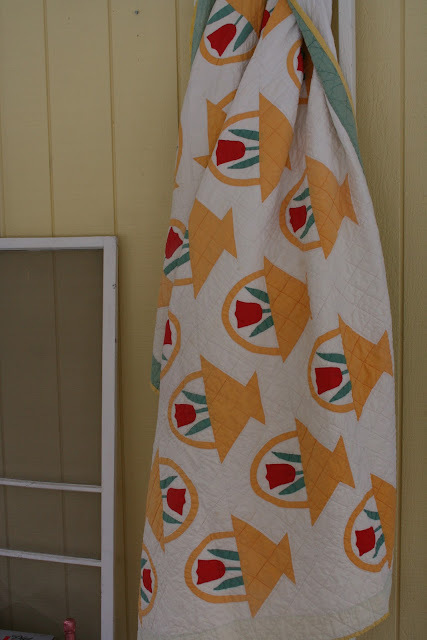 I have three more vintage quilts to share with you today. This first quilt is a baby quilt my friend Joanna dropped off to me the same day I received the other vintage quilts. Oh what a fun day that was! This quilt is square with nine blocks. Six blocks are the same fabrics and three are different. Joanna asked me why that was. 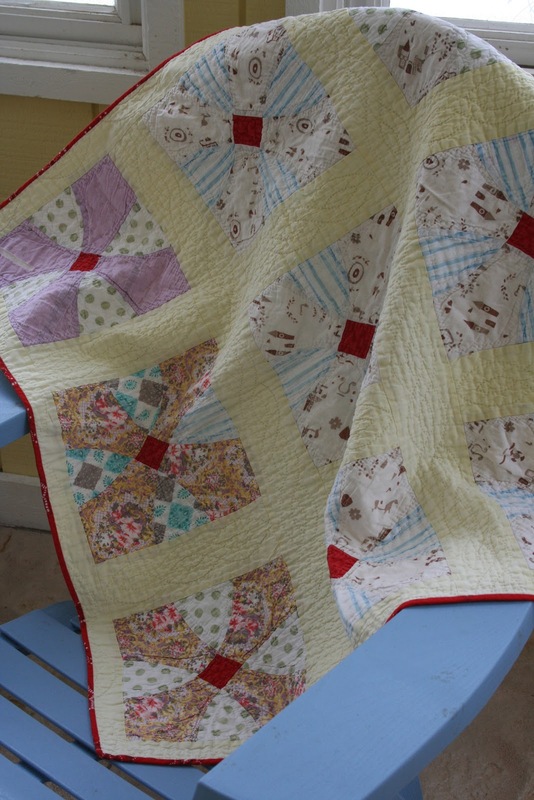 I told her a very resourceful quilter used what they had on hand to fashion this quilt. The pale yellow background adds a lovely touch. It appears to be bound with a red handkerchief, how creative! This tulip basket quilt is just so pretty! The rows are facing each other like the blue basket quilt showed you previously. This one has a couple of bad stains that won't budge. One actually looks like paint, the other black ink. It is still so very pretty and the applique and quilting are award worthy. It's a nice dose of spring today! Last of the bunch is a rectangular crazy quilt. Made up of mostly silk with a few other textural fabrics, this one is completely stitched with red thread in a feather stitch. The size would make a nice topper for a piano or an accent at the foot of the bed. Some parts are beginning to shred, but all in all, it is in good condition. I did not soak this one because of the speciality fabrics and all that red. I hope you have enjoyed my stroll through vintage quilts this week. I am so blessed to have friends and family that gift me with such treasures. It is making me take a look at how I quilt. Not everything needs to be "quick quilting". It seems the quilts I love the most are ones that were more involved and took more time. Each type of quilting has its place and I do both, but I encourage you to have something more challenging to work on along with your other projects. Have a great day! I love these beautiful quilts! Thanks for sharing these beautiful quilts. Thank you for sharing your quilts with us Renee. I have enjoyed seeing them. Thank you for showing these beautiful quilts! Some work of art! Quilts make me smile. Period. I agree, Dayle! They make me smile too! Oh that Tulip Basket is an absolute BEAUTY!!!! 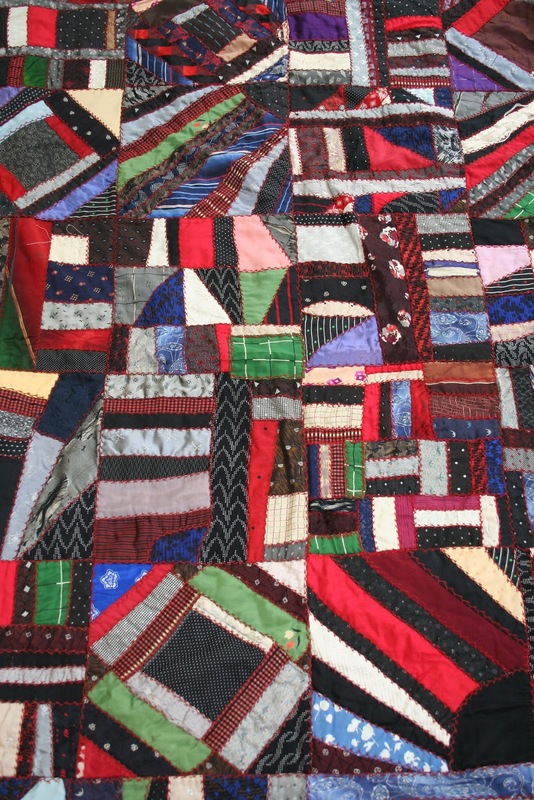 I've so enjoyed seeing all your vintage quilts. I especially love the baby quilt in this post and that it was done using just what the maker had on hand - that's how it all began! Thank you for sharing your newest treasures! How lovely they are! I just "found" your blog via pintrest and I will be back for inspiration!